Quite possibly the first domino has fallen in the Biogenesis situation as Brewers star Ryan Braun was suspended for the balance of the 2013 season by Major League Baseball. Braun of course failed a drug test over a year ago, but was able to get out of a suspension by winning his appeal on a technicality. Therefore, once his name was connected to Anthony Bosch and the Biogenesis clinic, there was no way that MLB was going to let Braun slide away once more. And now that he hasn't, this may very well mean that the league is about to go hard after all of those connected to Biogenesis, with one notable in particular. Maybe we should not be surprised that Braun ended up getting a pretty fair deal from MLB with this 65 game suspension, considering that it was thought that the evidence on Braun in this case was not all that substantial. But he got a pretty solid deal here. He loses the rest of the season when he has played poorly, the team is going nowhere, he only loses three million dollars in a large contract and now he gets to all but end this charade and move on by taking this suspension. Wouldn't you take that deal? Even as Braun tip-toed from outright admitting guilt, he now has this opportunity to move forward. But now that the Braun domino has fallen, it looks like this scandal is going to get deep if the evidence that MLB has in regards to Biogenesis is enough for somebody like Braun to fold and take a suspension. And we all know who the league is targeting next, Mr. Alex Rodriguez. 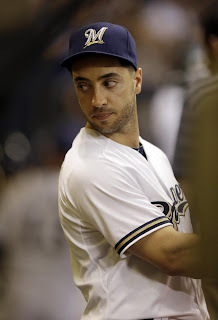 It has been reported that the league has much stronger evidence against Rodriguez than they had against Braun, and we know that they want to go after Rodriguez, partially because he has admitted to using steroids in the past before the testing policies were instituted and partially to send an example that nobody is above the law. We have seen reports that we could see a suspension of at least 50 games, 150 games or even a lifetime ban for Rodriguez, who reportedly is not cooperating with the MLB investigation. It seems like the steroid and PED issue is certainly not going away any time soon, and it is quite likely more heads are going to roll.